Ottawa, ON, March 15, 2018 – The Canadian Real Estate Association (CREA) has updated its forecast for home sales activity via the Multiple Listing Service® (MLS®) Systems of Canadian real estate Boards and Associations in 2018 and extended the outlook to 2019. Housing market fundamentals remain supportive in many parts of the country. By the same token, housing markets continue to face policy-related headwinds. New mortgage rules announced late last year had been expected to cause homebuyers to advance their purchase decision before the new rules came into effect in January, with the “pull-forward” of sales activity resulting in fewer transactions in the first half of 2018. Evidence suggests the policy response was stronger than expected, with seasonally adjusted national home sales having shattered all previous monthly records last December before dropping sharply in the first two months of 2018. When CREA previously published its forecast in December 2017, housing markets were being affected by provincial policy measures in B.C. and Ontario, and by the stress test on mortgage applications involving less than a 20% down payment. Rising interest rates and the announcement of a stress test on mortgage applications involving more than a 20% down payment set to take effect starting in January 2018 were also factors. Since then, more provincial housing policy measures have been announced to further cool housing markets in B.C. Additionally, interest rates have risen further and the stress test on mortgage applications involving more than a 20% down payment has come into effect. Interest rates are widely expected to rise further this year. Higher interest rates make mortgage stress tests a more difficult hurdle for homebuyers that need mortgage financing. Some homebuyers will likely to stay on the sidelines amid heightened housing market uncertainty and continue saving a larger down payment before purchasing, resulting in lower sales in the first half of 2018 followed by a modest rebound in the second half of 2018 as housing market uncertainty fades. Taking these factors into account, the national forecast for sales and average price has been lowered. National sales activity is projected to decline by 7.1% to 479,400 units in 2018. 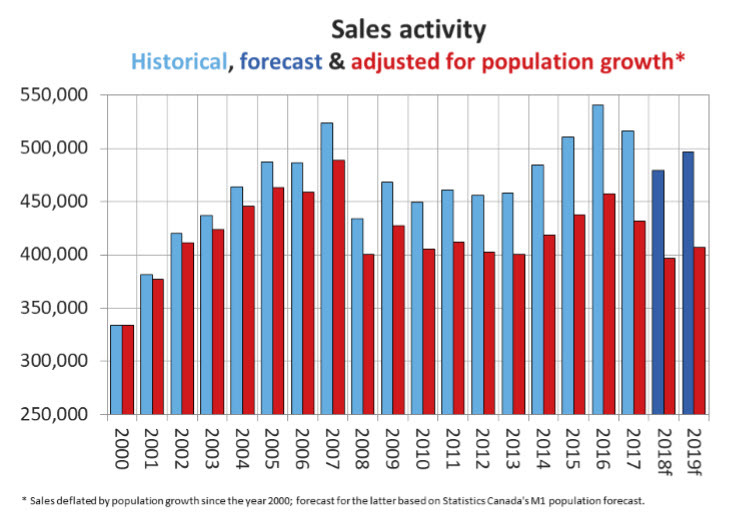 The decline reflects weaker sales in B.C. and Ontario, amid heightened housing market uncertainty caused by provincial policy measures, high home prices, ongoing supply shortages and tightening mortgage stress tests as interest rates rise. The national average price is projected to ease to $498,100 this year, down 2.3% from 2017. Only Newfoundland and Labrador is expected to post a decline of that size, while half of all provinces see average price gains. The decline in the national average price reflects fewer transactions in B.C. and Ontario; by the same token, price declines in these provinces reflect fewer sales of higher-priced homes in Vancouver and Toronto. Home prices in Eastern Ontario, Quebec, New Brunswick, Nova Scotia and Prince Edward Island are expected to continue to rise following years of steadily firming market conditions. Meanwhile, for the fourth consecutive year, home prices are forecast to be little changed in Alberta and decline in Saskatchewan and Newfoundland and Labrador. In the latter two provinces, supply remains elevated in relation to demand. In 2019, national sales are forecast to rebound modestly to 496,500 units but remain below levels recorded in 2015, 2016 and 2017. The rebound reflects an expected partial recovery of sales over the second half of 2018 in Ontario and B.C. followed by a gradual softening in activity over 2019 as previously deferred activity wanes and interest rates continue to rise. This trend is also expected in other provinces but be more pronounced in B.C. and Ontario, where transactions have fallen sharply in early 2018 despite a supportive economic and demographic backdrop for housing demand. The national average price is also forecast to rebound by 3.1% to $513,300 in 2019, placing it roughly in line with the 2017 figure. The increase reflects expected modest price gains in a number of provinces and a partial rebound of sales activity in B.C. and Ontario. Likewise, forecast price gains in B.C. 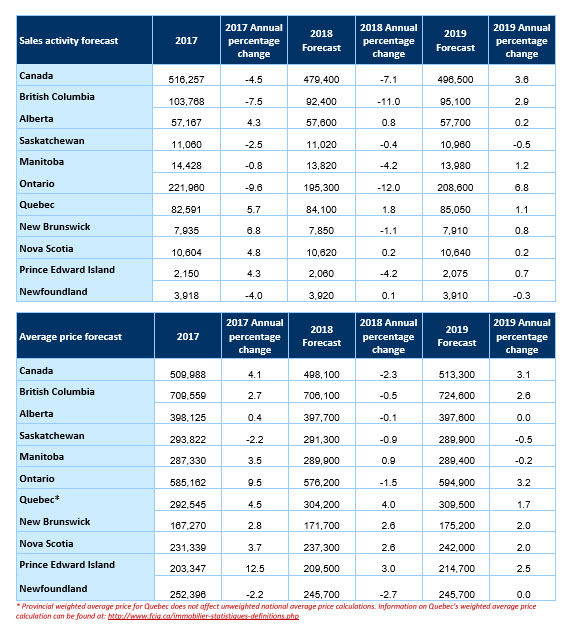 and Ontario in 2019 reflect an expected improvement for sales activity in Vancouver and Toronto and homes remaining in short supply relative to demand in these provinces. With market conditions continuing to firm up in Quebec, New Brunswick, Nova Scotia and Prince Edward Island, these provinces are forecast to see further modest price gains in 2019. Meanwhile, prices in Alberta, Saskatchewan, Manitoba and Newfoundland and Labrador are forecast to hold mostly steady from 2018 to 2019.